I thought that it would be fun to start a little mini series and I have chosen to give tips on Food Storage. I've chosen this topic b/c with our recent experience in a loss of income it has been on our minds, mine and my husband's, and we don't want to be stuck in that situation again. I am not an expert but wanted to share my research and ideas with you, so here goes. Rome wasn't built in a day and neither should your food storage/ stock pile. Take the time to carefully plan out what you need as far as what your family likes, meals you enjoy and even what kinds of products you use for hygiene purposes. Your storage shouldn't just be about food, but personal hygieng products as well. Look for sales and opportunities to stock up on the essentials, you can refer back to my Grocery post here for more info. Get the family involved to give some input as to what you would like to accumulate. For example, in my house beans, rice, tortillas and cheese are a MUST. We LOVE Mexican food and I always have these on hand to make burritos with. An easy way to help get started is to create a menu of the meals your family likes and go from there. Something to stock up on are pastas and sauce for a quick pasta meal. Have fun with it. 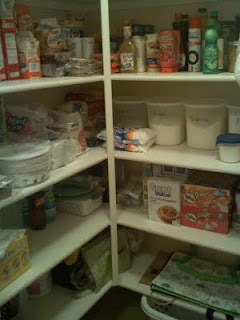 My Large pantry, in the laundry room. Isn't is pretty? :) I still have a ways to go.